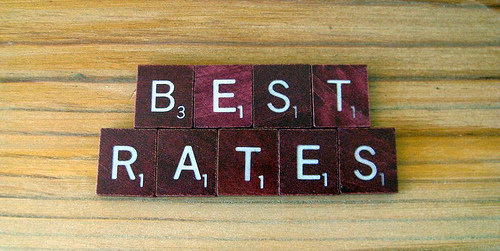 What Mortgage Has the Best Interest Rate? Before we dive in, “best” questions are always a bit difficult to answer because what’s best to one person could be the worst for another. Or at least not quite the best. But we can still examine what makes one mortgage rate on a certain product better than another, in certain situations. In a recent post, I touched on the different mortgage terms available, such as a 30-year, 15-year, and so on. That too was a “best” article, where I tried to explain which mortgage term would be best in a given situation. Related to that is the associated mortgage interest rate that comes with a certain term. Now I’m going to assume that by best you mean lowest, so we’ll focus on that definition, even though it might not be in your best interest. A lot of puns just happened by the way. Put simply, a longer mortgage term generally translates to a higher mortgage rate. So a 10-year fixed-rate mortgage will be much cheaper than a 40-year fixed loan. Additionally, an adjustable-rate mortgage will price significantly lower than a fixed-rate loan, as you’re guaranteed a steady rate for the full term on the latter. This all has to do with risk – a mortgage lender is essentially giving you an upfront discount on an ARM in exchange for uncertainty down the road. With the fixed-rate loan, nothing changes, so you’re paying full price, if not a premium for the peace of mind. If the rate is fixed, the shorter term loan will be cheaper because the lender doesn’t have to worry about where rates will be in 20 years. They can offer you a lower rate on a 10-year term than a 30-year term because the loan will be paid off in a decade as opposed to three. If rates rise and happen to triple in 10 years, they won’t be thrilled about your low rate that’s fixed for another 20 years. That’s all pretty straightforward, but knowing which to choose could be a bit more daunting, and may require dusting off a calculator. This can definitely vary from bank to bank, but it’s a rough order of how mortgage rates might be priced from lowest to highest. Most lenders don’t even offer all these products, but you can get an idea of what’s cheapest and most expensive based on its term or how long it’s fixed. Currently, the popular 30-year fixed is pricing at 4.22 percent, while the 15-year fixed is going for 3.44 percent, per Freddie Mac data. The hybrid 5/1 ARM, which is fixed for the first five years and adjustable for the remaining 25, is averaging 3.07 percent, and the one-year ARM is just below 3.00 percent (2.93%). There are other mortgage types, such as the 20-year fixed, 40-year fixed, 10-year ARM, 7-year ARM, and so on. But we’ll focus on those first four, as they’re the most popular. As you can see, the 30-year is the most expensive. In fact, it’s more than a percentage point higher than the 5/1 ARM. On a $200,000 loan amount, that would be a difference of roughly $130 in monthly mortgage payment and nearly $8,000 over five years. The one-year ARM would be even cheaper, though just slightly. And for a loan that adjusts annually, it’s a big risk in an environment where interest rates are likely at or near the bottom. As mentioned, the low initial rate on the 5/1 ARM is only guaranteed for five years, and then it becomes adjustable for the remainder of the term. That’s a lot of years of uncertainty. In fact, it’s 25 years. The 30-year fixed is, well, fixed. So it’s not going higher or lower at anytime. The ARM has the potential to fall, but that’s probably unlikely, given where rates are historically. So What’s Best Interest Rate Then? Well, that depends on a number of factors unique to you. Do you plan to stay in the home long-term, or is it a starter home you plan to unload in a few years? And is there a better place for your money such as the stock market or another investment? If you plan to sell in the near term, you could go with the ARM and use those monthly savings for a down payment on a subsequent home purchase. Just be sure you have enough money to make larger payments if and when your ARM adjusts higher if you don’t sell or refinance before then. Five years not enough? Look into 7/1 and 10/1 ARMs, which don’t adjust until after year seven and 10, respectively. That’s a pretty long time, and the discount relative to a 30-year fixed could be well worth it. If you’ve got plenty of money and actually want to pay off your mortgage early, a 15-year fixed will be the best deal for your money, as you’ll get the lowest, fixed rate available. The downside is the higher monthly payment. As a rule of thumb, when rates are low, it makes sense to lock in a fixed rate. Conversely, if rates are high, taking an initial discount with an ARM may make sense. And assuming rates fall shortly after, you can refinance to an even lower rate, thereby extending your fixed period a bit longer. This a no-brainer. Take the 15-year fixed, which offers the lowest interest rate and the shortest amortization period. You wind up paying much, much less interest than any other loan option. We’re talking tens of thousands of dollars less. Why choose anything else? True, the 15-year will save you a ton on interest, but with rates so low, you don’t need to pay your mortgage off as fast as possible anymore. These aren’t the days of double-digit rates. It’s not hard to beat the return on a fixed mortgage in the stock market or elsewhere. And you get a larger interest deduction, assuming you’re itemizing, making it even easier. A fixed rate is best, especially right now. Don’t be tempted to go with an ARM just because the rate is lower today. Rates are going to keep rising and you’ll pay more interest in the long run, assuming you don’t move or refinance again shortly after obtaining your mortgage. I disagree. An ARM has the lowest interest rate and most people move or refinance before the loan even becomes adjustable. So why go with a fixed loan and pay more if you won’t even keep the loan? Because ARMs can and will adjust higher, and not everyone moves in that short a time span. You certainly won’t want to get caught out if rates surge and you can’t afford to make your mortgage payments anymore. Go fixed for the security and relatively low rate. I’m considering a 10/1 ARM because the interest rate is around 4.25% vs. 4.875% for a 30-year loan. My thinking is that I will either move or refinance before its first adjustment, and save thousands along the way. That’s definitely an option, though there are obvious risks involved. If you don’t move or refinance, or your property falls in value and your rate spikes, you could be in a bit of trouble. But like you said, you’ll probably save thousands in the meantime. It’s all about what works for you. For me it’s the 30-year fixed, even though you pay a premium over the 15-year or 10-year. Where else can you lock in an interest rate that low for three entire decades? Agree on it being the 15-year fixed, otherwise you just pay a TON of interest and never really own your home. But I understand not everyone can afford such high payments, so a 30-year fixed might be the only viable option. If you live in a cheaper state, like Arizona, the 15-year fixed, or even a 10-year fixed can make a lot of sense, seeing that the monthly payment isn’t much more expensive. But I understand that’s not a reality in places like Los Angeles and New York.